A fast, healthy alternative to chips. 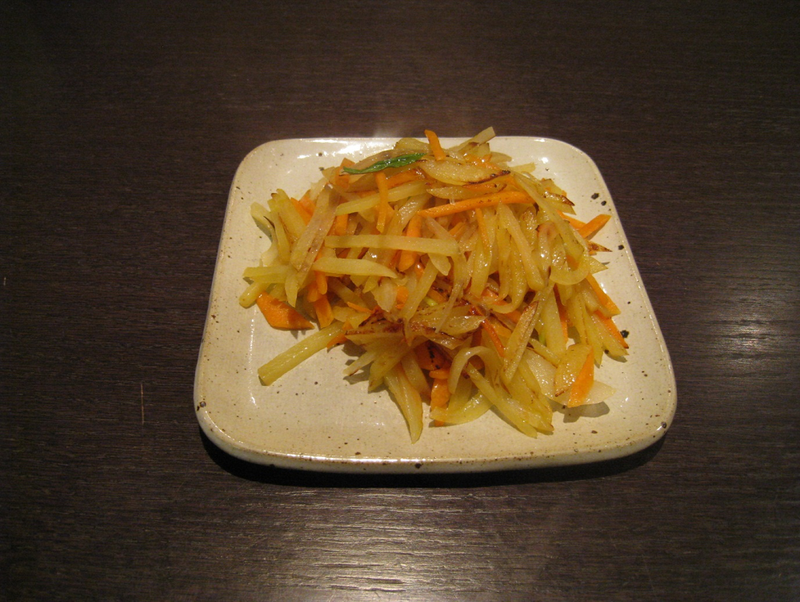 When I was a student, stir-fried potatoes used to frequently be in my lunch box. This is a popular side dish in Korea being an inexpensive and healthy complement to rice as a staple. This dish is always accompanied with a bowl of rice in Korea. to a healthier version which has almost no oil in comparison. like other Korean dishes so you can have this with your children or simply add sliced beef, pork or chicken to make it main meal. Slice all the vegetables (2 potatoes, carrots, onions, spring onions and grated or sliced garlic). Pour 1 tablespoon of olive oil into a frying pan and add the sliced potatoes and stir fry them for 2 minutes on a high heat. Add the carrots, and onions then stir fry for a further 1-2 minutes on a medium heat. Sprinkle a pinch of salt, the white ground pepper, sugar, sesame seeds and lastly add spring onions and stir fry for another minute.